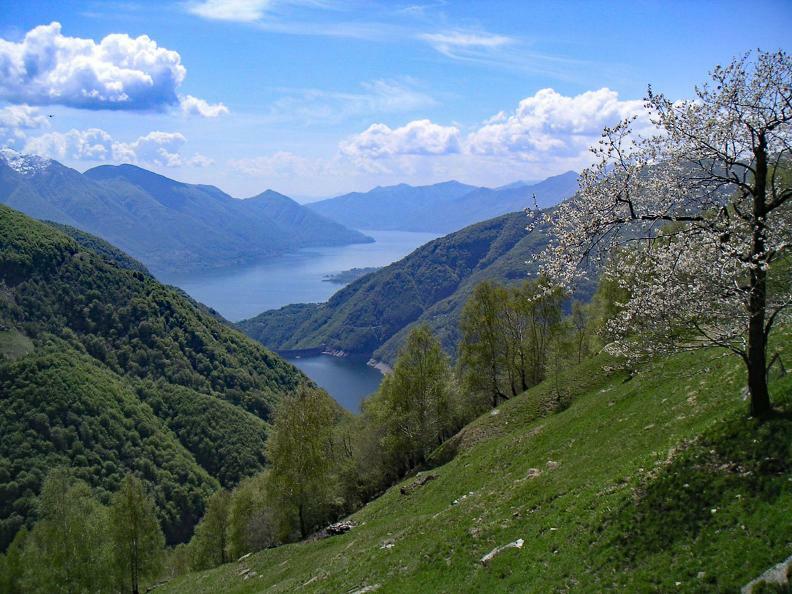 A mountain excursion from Vogorno to Bardüghè via Odro, with a difference in height of 1180 m and with breath-taking views of the artificial Lake of the Verzasca dam and the Lago Maggiore to quicken the heart of any mountain walker. economy. The farming activities that take place at Odro and the board and lodging facilities available make this tour a model of ecologically sustainable tourism. Odro is a rural settlement perched on the slopes of Pizzo Vogorno at an altitude of 1200-1300 meters, situated between the village of Vogorno (500 m) and Alp Bardüghè (1600 m). 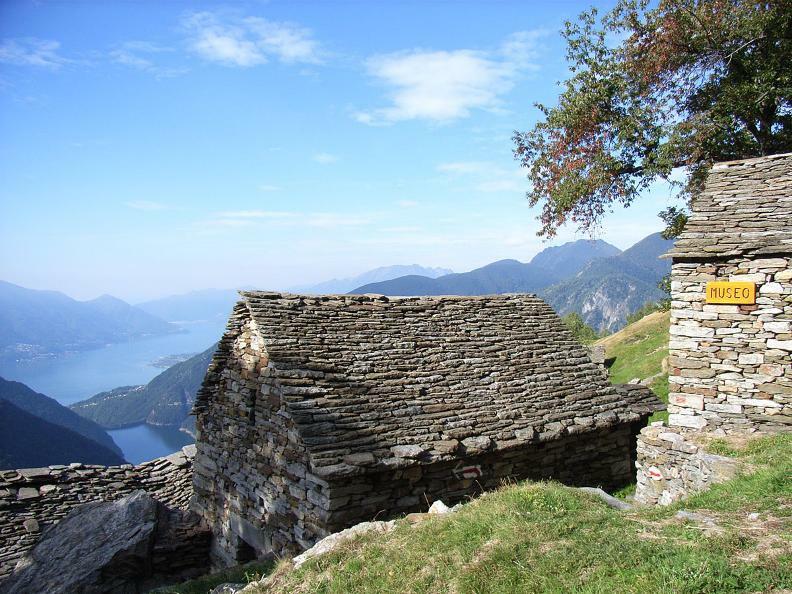 It is reached via a steep but easy mountain path which runs along a long ridge separating Valle del Molino from Valle della Porta, passing several hamlets along the way (Colletta, Torlètt, Stavéll and Pidoo). 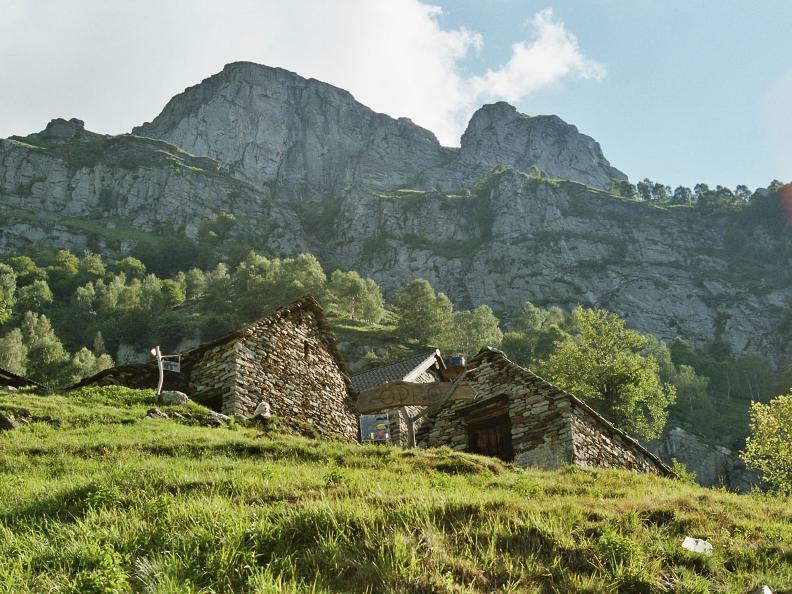 Once used as high-mountain pasture-land in the traditional system of exploiting the alp, Odro consists of four small hamlets (Técc Fond, Ticc Zòtt, Sert and Cim’al Prov). Odro’s ancient origins are evidenced by a large rock featuring cup-shaped engravings situated at the centre of the hamlet of Ticc Zòtt and by the dates found on some of the buildings (seventeenth and eighteenth centuries). The remains of an old mill can still be seen today below the small chapel (see point 2 below), to the west of the stream in Valle del Molino. Around the middle of the nineteenth century there were two working mills, then belonging to the Anselmi family. The chapel is situated just past the bridge, at the foot of an imposing flight of steps. A closer look at the hill of Calvary reveals it to be a large stack of hay (mèda in the local dialect). 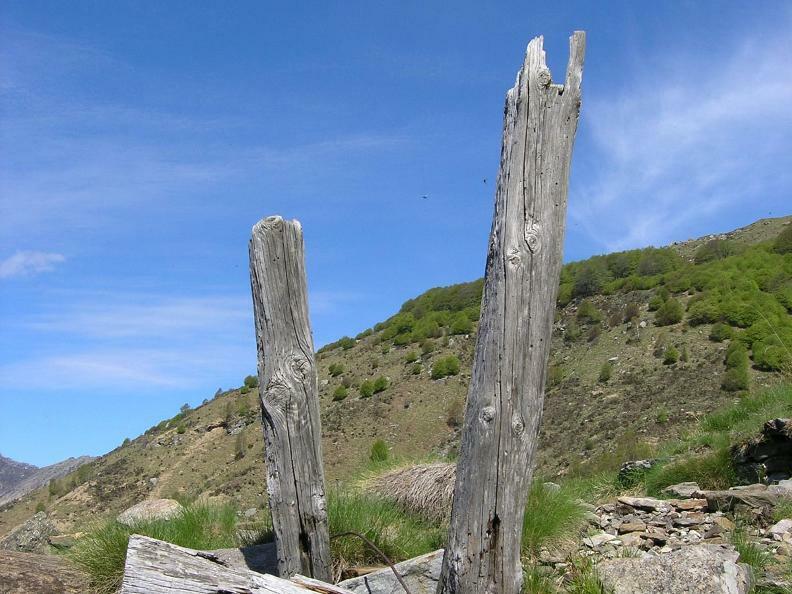 According to various sources, the two rustic wooden crosses (previously at least three) hanging on the walls outside the chapel allude to those who died on the mountains above while making hay. The subject of the painting (the procession to Calvary) and the shape of the hill represented do not appear to be a random choice. At Colletta there is a seventeenth century oratory dedicated to Our Lady of Sorrows. The chapel is thought to have its roots in an apparition of the Virgin Mary to an inhabitant of Vogorno in that very location. In the past, the oratory was reached by procession from Vogorno once a year on the Friday before Palm Sunday. The path winds its way up through a beautiful wood of majestic, monumental chestnut trees reaching an altitude of 900 m.
As soon as you reach the ridge at Mount Stavéll, you will see the departure and arrival points of various ropeways. The rope leading down into the valley is anchored to a large rock and supported by three poles. 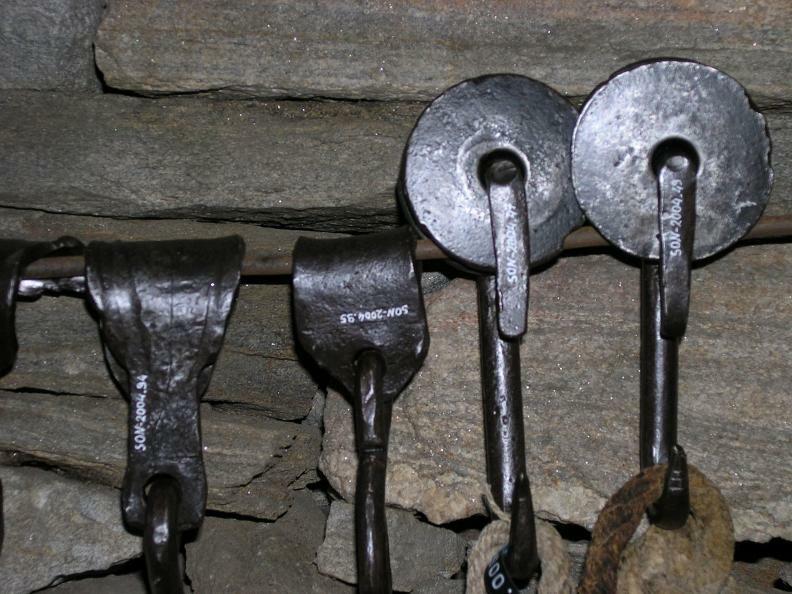 There are two terminals: these are the destination points of the ropeways which led down the mountain from Odro. On a large rock at the centre of the settlement of Odro you will see various cup-shaped engravingsancient signs left by man, the age and meaning of which remain unclear. 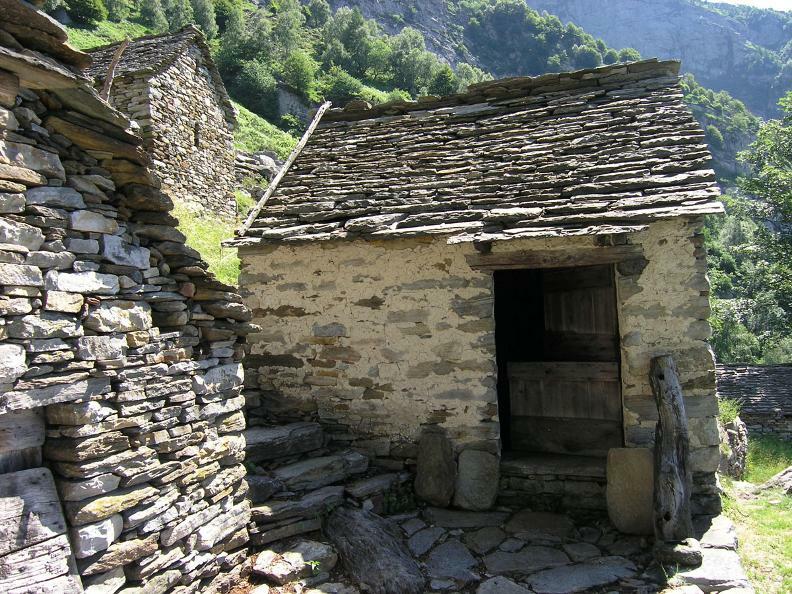 Some of the buildings have been restored and, with its “Nera” goats from the Verzasca Valley, the small farm scythes the mountain grassland and keeps the slopes tidy. The delightful, hospitable alpine establishment provides a very welcoming place for excursionists to stop for a meal and spend the night. The site is equipped with a small turbine, which produces enough energy for the hosts and their guests, and a spring, which provides a constant supply of fresh water. Currently the farm is managed by Tobias Bührer and his team. 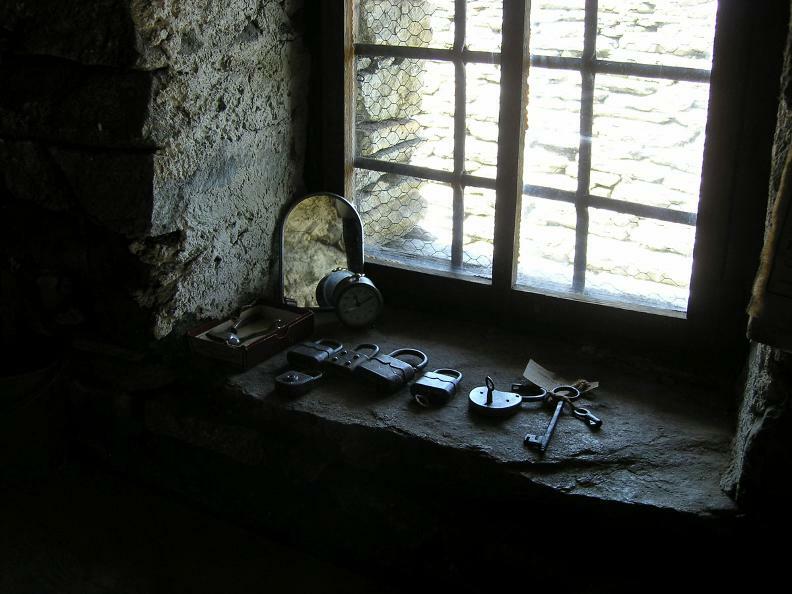 The highlight of the trail is the small museum in the hamlet of Sert. It is housed in the former temporary dwelling of Luigi Berri (1904-1988), who left the place intact when he stopped working there at the end of the 1960s, leaving behind all his tools and utensils. 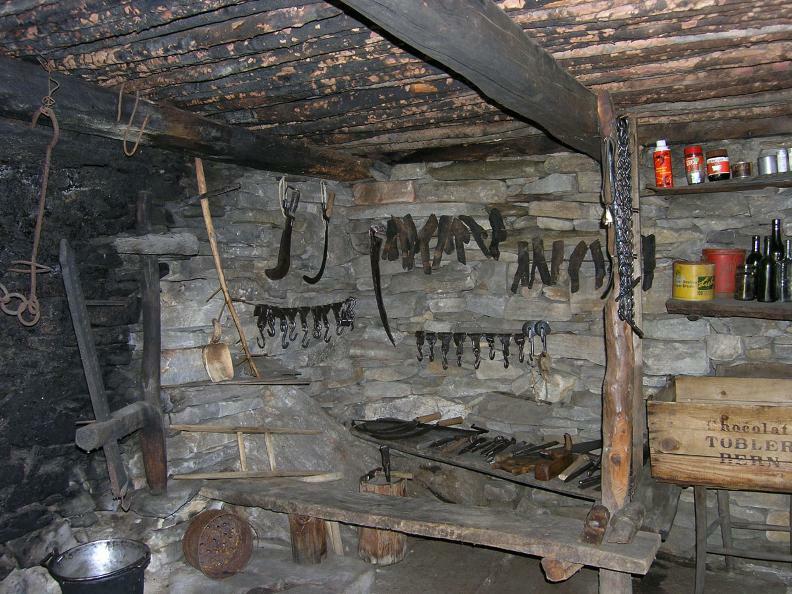 On display in the small dwelling are the tools which he used in order to perform various jobs, most importantly that of wild-hay harvesting. The upper end of the pasture-land at Odro is bounded by imposing dry-stone walls. Above Odro are various terminals of ropeways which crossed Valle del Molino. The anchorage point of these ropes has been found below Alp Bardüghè on the opposite side of the valley, which goes to show that the ropeways formed an effective transport network. At an altitude of 1600 meters there opens up a vast plateau of mountain pasture-land, which was used for grazing livestock in the summer. Bardüghè—at 1520 m, below the alpine settlement of Bardüghè, is fascinating. 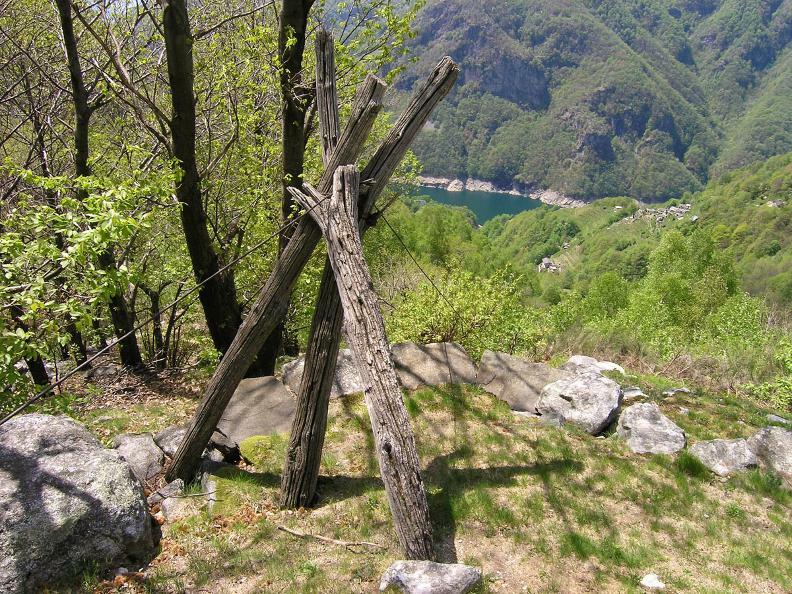 The inhabitants of the mountain used to call it the “sacred wood”. This name—very common throughout the alps—may well have a dual origin. On one hand, it could allude to the wood’s function of protecting the inhabitants (indirectly, at least) from avalanches; on the other hand, if the beechwood was really called Merisg da Bardüghè as well, then the wood may owe its sacred, untouchable nature to the fact that it protected nearby livestock from the sun in the hot summer months. Consequently, the “sacred wood” was off-limits for wood-cutting. ago and has since become thickly wooded with many types of trees. Here and there are majestic age-old chestnut trees bearing witness to the chestnut woods which once used to cover vast areas of these mountains, especially close to residential areas. The chestnut was once a very important part of the diet and was used in a wide variety of ways, which cannot be included here for reasons of space (more information is available in the interesting booklet about chestnuts by Laura Sofia issued by the Swiss Centre for Dialectology and Ethnography in Bellinzona as part of its “Le Voci” collection). The study by the Swiss Federal Institute for Forest, Snow and Land-scape Research (WSL, www.wsl.ch/sottostazione) also deserves a mention: its aim is to register and study the older chestnut tree specimens, the so-called “monumental chestnut trees”, in the Italian-speaking part of Switzerland. The chestnut tree along the path—unfortunately in quite a bad state—is one of the 310 trees registered by the Institute. By no coincidence, it is located close to the original route of the path, which went round the tree (the conformation of the ground and various rocks once used as resting places bolster this hypothesis). In addition, it was the tree that marked the entry to more valuable land closer to the settlements. According to the study, as many as 23% of all the monumental chestnut trees registered are to be found in similar settings. 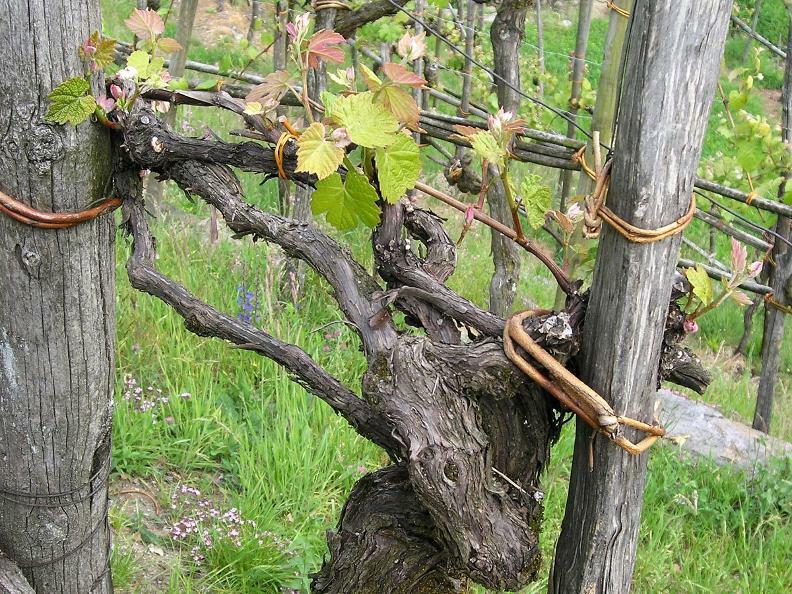 chestnut trees, these old stocks of hardy grapevines complete the plant landscape, which was vital to those engaged in subsistence farming.